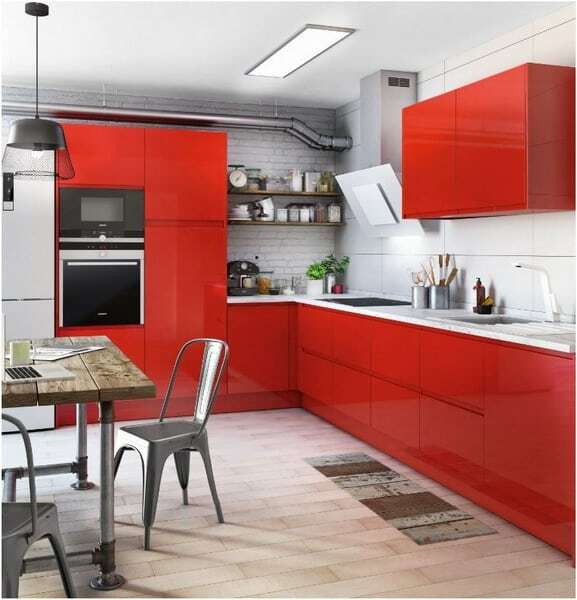 0.0.1 Choosing the best Fluorescent Kitchen Lighting is a decision of function and form. 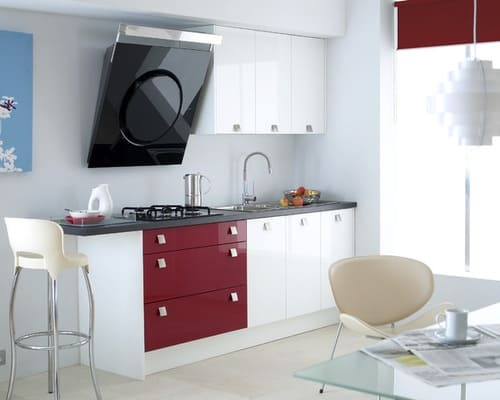 Choosing the best Fluorescent Kitchen Lighting is a decision of function and form. The kitchen space can be divided into task stations, such as sink and stovetop. A kitchen also has unique interior designs, such as countertops and cupboards. These are the considerations when installing energy-efficient sources of lighting. Many countries, including the U.S. and Japan, have adopted national energy policies and regulations that encourage the use of fluorescent light bulbs. One consideration for Fluorescent Kitchen Lighting is a basic understanding of its physics. The bulbs are essentially white neon. The liquid metal mercury in gaseous state is excited by electricity to emit ultraviolet light. This light, in turn, causes another phosphor element or chemical compound to fluoresce, or glow with its signature color. It can also be thought of as a perpetual firework display contained within a glass enclosure. The phosphorus compounds that coat a household fluorescent lamp can vary, but they are generally formulated to emit white light. Nevertheless, mercury’s ultraviolet radiation will produce the cool, bluish tint characteristic of fluorescent lighting. Bulbs rated 2700K (Kelvin) will have the warm, reddish tint of familiar incandescent light. Those rated 3500K will shine cooler, more like white sunlight. The commercial designation of “warm white” is preferred over “cool white,” which is for industrial use. The most popular use of Fluorescent Kitchen Lighting is the overhead box, perhaps above a center island designed as both platform for food preparation and table for service. The opaque cover for the box can be tinted to provide a shade of light better complimenting a kitchen’s design and decor. The bulbs in the box are almost always of the straight tube variety in large diameter. Smaller fluorescent kitchen lighting bulbs can be deployed elsewhere for spotlighting work areas and accenting niches. Coiled CFL’s, or compact fluorescent light bulbs, can be screwed into sockets above a sink. Most will fit within recessed can fixtures. For bulbs of low wattage around 25, perhaps part of the display of treasured kitchen decorations, the extra cost of one equipped with an electronic ballast to control the characteristic “flickering” of these lights may be worth the expense. 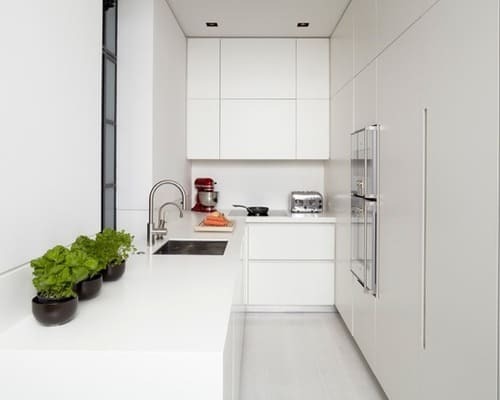 Kitchens are necessarily built with cabinetry, shelves, counters and other nooks. Fluorescent lighting can accentuate these spaces and create depth to the room. Popular techniques include lining the uppermost ledge of a wall cabinet to project indirect light upward and vault the room’s ceiling. This is usually a matter of choosing the right length. The right diameter is the main consideration for other fluorescent kitchen lighting. Including their fixtures, they can range from 4 inches (10 cm) to small, under cabinet lamps of less than 1 inch (2.5 cm). The latter illuminates the countertop below wall shelving and is a dramatically aesthetic, but also very functional, use of kitchen lighting. Generally, cost is related to miniaturization or specialization, so the rule is to choose the largest fixture that will not be visible.